I am thinking to have a weekly post on salads, because I have a special place for salads in my heart. However, I am not going to write about the ‘usual’ salads, the salads that the majority of you are familiar with. 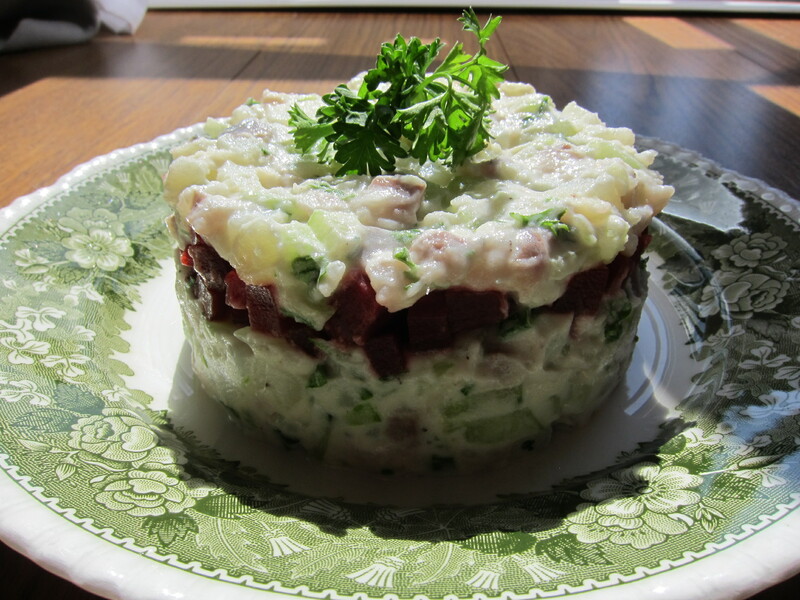 I’d like to introduce you to the salads I grew up with, salads which came from the Baltics. And let me be honest with you, some of these salads won’t be shy of calories, but don’t let that put you off too quickly, have a go,- little bit of what you fancy in small quantities is good for you and didn’t harm anyone yet. Never the less, I will introduce you to the healthy varieties too (it’s not only about meat, potatoes and mayo!). Today, I’m going to open the ‘marathon’ with the simple but one of my favourite variety of Potato salads, to be precise..
1. Boil the potatoes unpeeled until it is fork tender and cooked through (about 30 mins). Cool it completely, peeled the skin off and cut into small cubes. 2. 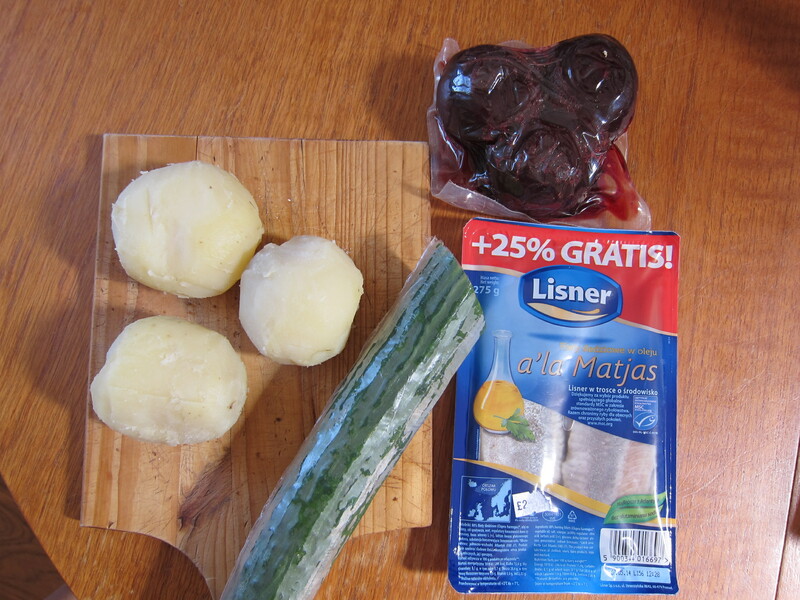 Cut the cucumbers and herring fillets into similar sized pieces and combine with the potatoes, add shallots (or spring onion). 3. Add soured cream and mustard, salt and pepper and mix into the salad base, combine everything together but gently, do not over mix. 4. Cut the beetroot into the same sized pieces. At this stage you can combine them into the salad mix but I prefer to create a separate lever (see a picture below), otherwise everything will look like a one big pink mess. 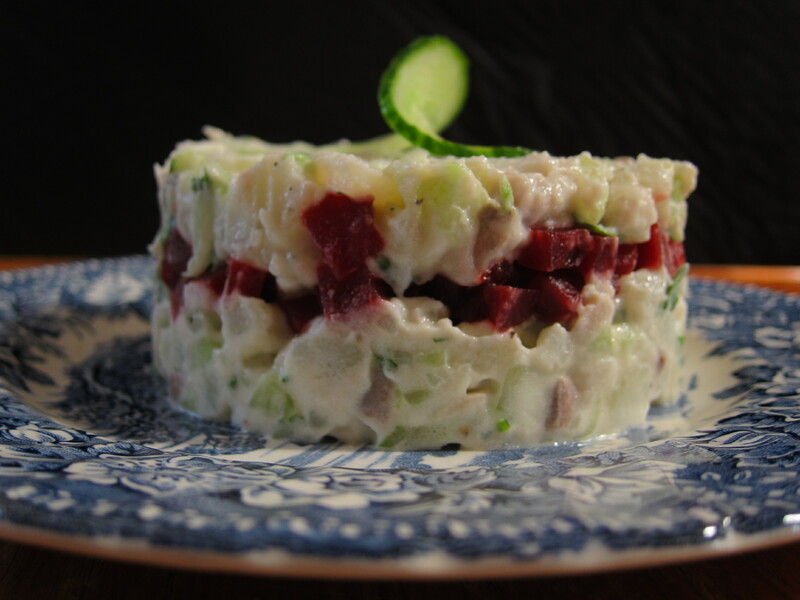 You can serve it as a starter or a light lunch with slice of rye bread.